Our Evening Bike Tour takes you to the best lit monuments as the sun is setting over Paris. 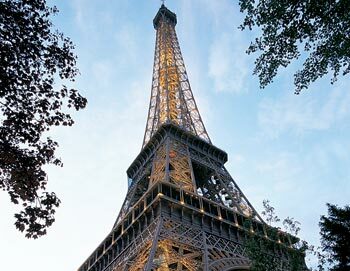 Among other things you'll discover the wonders of The Eiffel Tower at night, Champs-Elysées, Notre-Dame and the Louvre. It's a beautiful and fun sightseeing tour of Paris! The Eiffel Tower, The Louvre, Champs-Elysées, Notre Dame and a boat cruise along the Seine River (45 min). No, but children from age 0-4 are free, when accompanied by a paying adult. - During certain months the sun does not set until quite late, so this tour can end up taking place partially in the day light. Tour finishes around 11 PM and the metro runs until 1 AM.